You may have noticed, more men than ever are deciding to shave their heads. While the reasons are many, one thing is for sure - you need a razor especially designed for the purpose in order to provide a comfortable and efficient shave. Todd Greene, founder of the HeadBladehas brought this unique razor and shaving style to market for just this reason. If you shave your head, or are thinking about it, the HeadBlade is worth your consideration. The year was 1997. Todd Greene had been sporting a shaved pate for five years. Unfortunately shaving was not a 'good' experience. In truth, it was an inconvenience. But, through thick and thin, he was committed to the shaved look.. The blades were good but the handles were unfit for the job. If there was a way for the hand to become the 'handle' Todd figured he may have, indeed, the ultimate head shaving razor. The patented suspension of the HeadBlade gives you even more control; you don't have to worry about the angle of the blade. Think of a conventional handled razor. It's like a unicycle and only touches your head at one point (where the blade is). This is very difficult to control (both the angle and pressure of the blade). Especially if your fingers aren't in contact with your scalp. The HeadBlade, in contrast, has a suspension and touches your head in two places; like a bicycle. 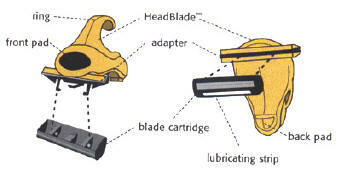 HeadBlade is designed to use either the HeadBlade cartridges or Gillette Atra compatible pivoting twin blade cartridges with the standard adapter or Gillette Sensor compatible pivoting twin blade cartridges with the Sensor adapter. The blade is mounted in such a way that you push/drive rather than pull the razor over your scalp. It may take some getting use to since you lead with the blade. Simply slip your middle finger through the loop (up to around the second knuckle) making sure the HeadBlade is nested palm-side. Rest the HeadBlade on your scalp (make sure the back wheels are always in contact with your scalp). Now take a long smooth stroke using NO pressure - the razor should glide over the scalp. The razor uses an adapter that clips onto the razors track, and then the blade attaches to the prongs of the adapter. Use a gentle sideways movement to attach and detach the blade so the prongs do not break. Let the razor glide. Lead with the blade. It is best to shave with the grain of hair growth for the most comfortable shave. 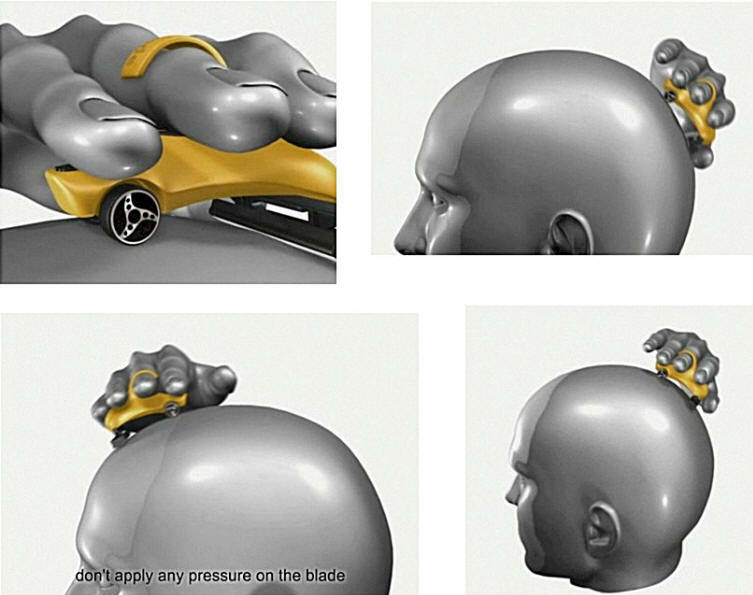 You can turn the HeadBlade around to lead with the blade depending upon what area of the scalp you are shaving and which way you want to drive the razor. Also, use your left or right hand as needed. How to use the calipers that come with the HeadBlade® brand cartridge blade replacement packs. What about head protection? Em's Place, Inc. also carries additional after shave, skin toners and moisturizers to complete the experience. Q: Why is the blade in the front of the HeadBlade and why do I push instead of pull it? Should I apply pressure? 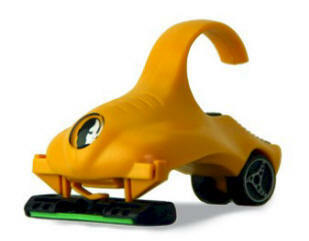 A: After extensive development it was found that the automatically pivoting blade of the HeadBlade® had to be in front. Pulling the blade across your head creates lateral movement of the blade which results in nicks and cuts. Pushing the blade eliminates lateral movement. And no, you don't need to press down on the razor (no press down big boy). The only pressure you need to put is on back pad to make sure it stays in contact with your scalp. Q: My fingers go up and down in size (mostly in girth) depending on the weather. Is the HeadBlade® adjustable? A: Yes. The HeadBlade is made out of a high quality plastic (it contains a lot of rubber) and the ring can be adjusted to just about any finger size. To adjust your HeadBlade warm the ring with a hair dryer (not your own of course) and then gently manipulate the ring to the appropriate size. Q: How long will it take to rid myself of the bad habits accumulated over years of shaving with a conventional razor to fully appreciate this new method? A: The HeadBlade fits right inside the palm of your hand and you may get the hang of it right off. But be patient, it may take you three to five shaves before you become fully comfortable with the HeadBlade and its revolutionary method (if you didn't pass 4th grade you may experience a longer learning curve). Once you do get the feel of the HeadBlade you'll see your shaving time cut dramatically. And you'll get a better shave. Note: The HeadBlade should last a year with regular use. However, after eight to nine months you should consider purchasing a new one. The adaptors will last about six months depending upon use. HeadBlade is a registered trademark of the HeadBlade Company, LLC. The Gillette Sensor and Atra are registered trademarks of The Gillette Company. Em's Place, Inc. is not affiliated with HeadBlade or The Gillette Company.